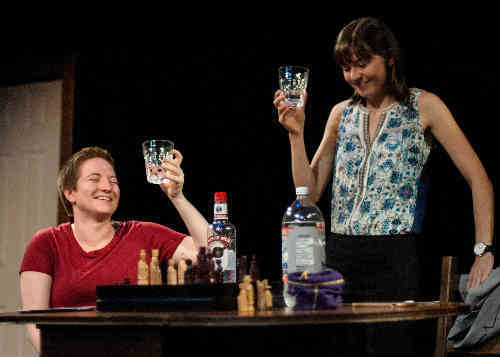 This summer, the Toronto Fringe Festival will feature two works by award-winning playwright Michael Ross Albert (Tough Jews, Dora Award nomination– Outstanding New Play), including the world premiere of his newest drama, Anywhere. When a young businesswoman returns to her AirBnB, she finds that her host has been waiting up for her. What started as a cordial relationship between strangers begins to steadily escalate into a tense and unnerving battle for control. The two women find themselves facing off against each other in a struggle for meaning, connection, and power. The world premiere production will be directed by David Lafontaine (artistic director, Unit 102). David recently directed the Canadian premiere of Michael Ross Albert’s play, Miss, for which he received the My Entertainment Critics’ Pick Award for Outstanding Direction in the small theatre division. The cast of Anywhere features two pillars of Toronto’s indie theatre community: Courtney Ch’ng Lancaster(founding member of The Howland Company, resident artist at Soulpepper Theatre Company) and Cass Van Wyck (Therac 25, Unit 102). With a thrilling new script, and a knockout cast and creative team, the world premiere of Anywhere promises to be an intense and unforgettable Fringe experience. Content Warnings: Mature language; Sexual content; Realistic violence or gore.